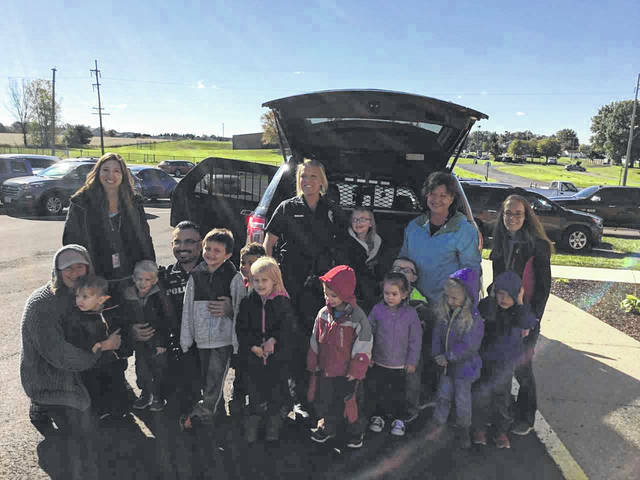 Courtesy photo Students at Fairway Preschool enjoyed learning about safety from members of the Bucyrus police and fire departments on Oct. 18. BUCYRUS — Local professionals from Bucyrus fire and Bucyrus police departments were on hand Oct. 18 at Fairway Preschool had a Safety Day. The students took part in fire safety week, during which they learned about what an emergency is, how to call 911, and how to stop, drop and roll. Students navigated through five areas which included: a gym activity, fire safety, tools used by firefighters, police officers, and bus safety. The gym station included activities such as practicing stop, drop, and roll and walking on a balance beam. During the fire safety talk, the firefighters discussed what to do in case of a house fire. A firefighter dressed in his gear had each student give him a high-five. The importance of not being afraid and coming to the firefighter in the case of a fire was made clear to the children. While visiting the fire truck, the students were able to get a close look at all of its equipment. The police officers showed the students the different tools they carry and how they keep others safe. The students were able to sit in the police car and turn on the lights and siren. For bus safety, the students learned how to exit in case of an emergency and learned about bus stop safety. For example, staying 10 feet back from the bus until signaled by the driver and not going after papers that have blown under the bus. Safety Day was a way to review what the students had learned to help them to gain more knowledge in a concrete manner about the topics discussed. Preschool students benefit from hands on activities and Safety day was a way to provide that for them. We would like to thank the Bucyrus Fire Department, Bucyrus Police Department, and Ohio Specialty Services (OSS) for assisting Fairway Preschool with this activity. Fairway Preschool is operated by Crawford County Board of Developmental Disabilities and is a full day integrated preschool for up to 80 students. Fairway has earned a 5 star step up to quality rating. The Crawford County Board of Developmental Disabilities, located at 1630 East Southern Ave, Bucyrus, Ohio 44820 serves over 350 children and adults at Fairway School, public schools, and through private providers. https://www.galioninquirer.com/wp-content/uploads/sites/38/2018/10/web1_fairway.jpgCourtesy photo Students at Fairway Preschool enjoyed learning about safety from members of the Bucyrus police and fire departments on Oct. 18.